first watch to feature a case made of pure boron carbide. The name and design of the 25 limited-edition timepieces pay tribute to the new Mercedes-AMG GT sports car. In another anniversary highlight at Goodwood, the two brands pitted three outstanding high-performance vehicles against each other: the first AMG race car (the 1971 'Legend of Spa'), the new Mercedes-AMG GT sports car and a Mercedes F1 W04. IWC Schaffhausen and Mercedes-AMG are united by their innovative engineering, exquisite craftsmanship and purism. These parallels are elegantly expressed in the new 'AMG GT' edition of the Ingenieur Automatic. In an industry first, the multipiece case of the watch is made from high-tech ceramic boron carbide, one of the hardest and most scratch-resistant materials known to man. 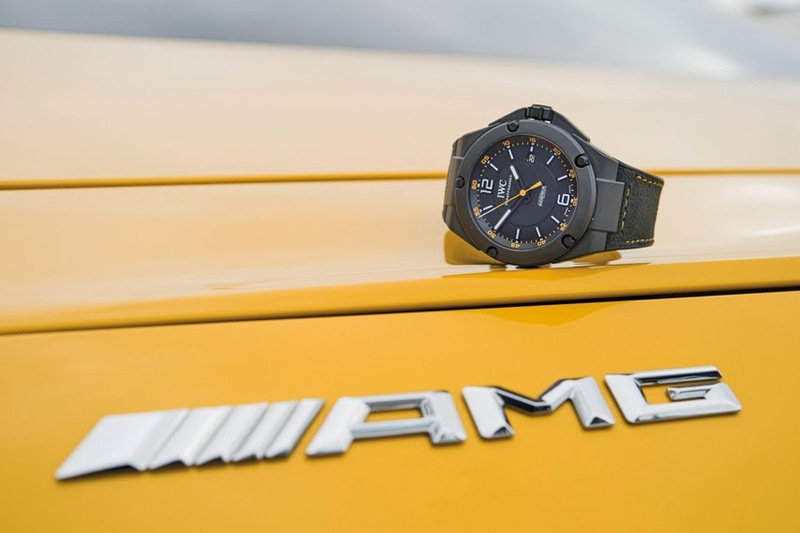 The watch design is inspired by the styling of its namesake, the AMG GT. Its black is beautifully accented with yellow design features in a nod to the exclusive AMG colour shade 'solarbeam'. The rubber strap has yellow lock stitch seams and a black inlay of innovative Dinamica microfibre, as found on the steering wheel, seat upholstery and roof lining of the new Mercedes-AMG GT.